Before your church even thinks about replacing that old pipe organ, find out what can be done to save it, and bring it up to modern standards and top operating condition. It usually costs a whole lot less in the long run to take good care of the organ you already have! Routine repairs and troubleshooting; dead notes, cyphers, etc. Wind Chest rebuilding; releathering, magnet replacement, etc. - If the wood is solid, the wind chest (and a lot of money) can be saved. Console rebuilding; solid state relays and combination actions. - Save that beautiful wood case and those irreplaceable ivory keyboards. - Recently completed a total rebuild of a 1950 3-manual Moller console. Projects can be done in stages, as funds become available. 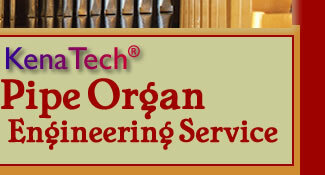 When possible, work is scheduled so the organ will play on Sundays! Check out the photo gallery of the relocation of a large pipe organ from its original home to the new addition at Prince of Peace Evangelical Lutheran Church in Medina, Ohio. 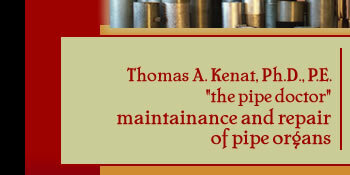 While this project is more extensive than most that KenaTech handles, it demonstrates all of the varied capabilities of KenaTech Pipe Organ Engineering Service.